Info "Find the winning frozen treat!" 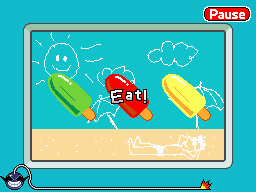 Ice Pop Star is one of Ashley's microgames in WarioWare: D.I.Y. To win the game, the player has to find the popsicle stick that says "win". To do that, they have to tap the popsicle to eat part of it. The message says "Win", "Too Bad", "No Good", "Will U? ", or "Win?". If the player finds the popsicle stick that says "win", they win. If the players runs out of time or if they don't uncover the whole part of it, the game ends in a loss.